Davey Lambert from Gateshead has died from his injuries following a crash in Sunday's RST Superbike race. An English rider who crashed in the RST Superbike race at the Isle of Man TT on Sunday has died. Davey Lambert, who was transferred to hospital in Liverpool, passed away on Tuesday evening. Davey Lambert pictured before the start of Sunday's RST Superbike race. A statement issued by the organisers said: ‘ACU Events Ltd regrets to announce that Davey Lambert, 48, from Gateshead, in Tyne and Wear, died this evening following injuries sustained during the Superbike race on Sunday 4th June 2017 at the Isle of Man TT Races. ‘Davey had an accident at Greeba Castle on the third lap of the race and was treated at the scene before being taken by airmed to Nobles Hospital. He was subsequently transferred to Aintree Hospital in Liverpool where he passed away this evening. 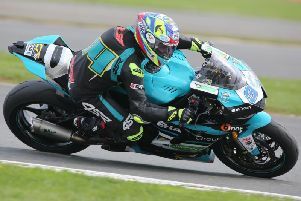 ‘Davey made his mountain course debut at the Manx Grand Prix in 2014, finishing fourth in the Newcomers A race and 24th in the Junior Manx Grand Prix of the same year. He returned to the Manx Grand Prix in 2015 and recorded 9th and 11th place finishes in the Junior and Senior MGP respectively and was eighth in last year’s Senior MGP Race. ‘ACU Events Ltd wishes to pass on their deepest sympathy to his partner Tracey, his family and friends’.